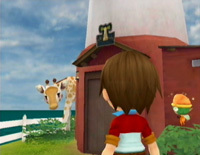 Once a season at 3:00 pm, Theodore appears with his animal friends. He sets up his circus tent at the church plaza, and stays there until 8:00 at night. The first time Theodore comes to visit is on Spring 22 of your first season in the game. When you talk to him you'll learn that some of his animal family has wandered off! While Theodore was off chasing a cute little cat that he saw, three of his circus members wandered away. Theodore asks that you go and find them for him. He tells you that if you use the Animal Whistle in the areas he tells you to, the lost circus employee should reappear. The wandering animals are probably hungry by now, so the circus master also gives you 3 cooking recipes; Grilled Herb Fish, Bread, and Vegetable Pizza. These will come in handy later. The exotic animals will be attracted by the sound of your Animal Whistle. It is a good idea to have the special cooked recipe in your Rucksack and ready to give when you find the animal, else you'll waste time running back to your house to cook up the dish and then hurry back to the spot you found the beast. Even after you find Theodore's missing companions, their home is the circus. You can not house any of the exotic creatures on your own farm, and Theodore will not sell you his circus friends. The first exotic animal you need to find is Eunice the giraffe. Theodore feels that he is somewhere near, but by something tall. Head down to the lighthouse in Harmonica Town and blow your Animal Whistle. The shy creature will pop his head from out from behind the building. Fin suggests in order to earn its trust, you should bring him a Good Herb Grilled Fish. Once you have the Good quality cooked recipe, return to the lighthouse and blow your Animal Whistle again. Select the food from your inventory when prompted, and you'll make Eunice happy. The giraffe will automatically return to the circus, so head back and talk to Theodore. 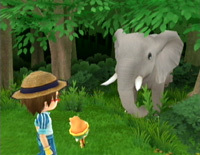 The next animal you have to find is the Elephant, Trunks. Theodore believes the large fellow is somewhere near a forest. Blow your whistle when you are near the entrance of Fugue Forest and you'll find the packaderm. Trunks would like some Bread. You can make it with your Oven and some Wheat Flour, Milk, and Butter. You can get the Milk from your own cow, or buy Decent Milk from Horn Ranch for 340 G. You can also buy Decent Butter from the ranch for 380 G, or make it yourself by purchasing the Butter Maker from Barbara for 3800 G.
The Wheat Flour is a little tougher to get. First you'll need to upgrade Marimba Farm to level 2 by shipping 30,000 G worth of crops that you have produced on your farm. Ruth will then have Decent Wheat (260 G) and Good Wheat (300 G) for sale at her shop. For the Bread you can use either quality of Wheat. Buy some and then go to the Water Wheel next to the bridge in Flute Fields. Go through the door on the left-side of the building and you'll find a place you can grind your Wheat into Wheat Flour. Combine all 3 ingredients with the Oven utensil and you'll make the Bread. Give it to Trunks and then return to Theodore. The last lost animal is Humphrey the Hippopotamus. 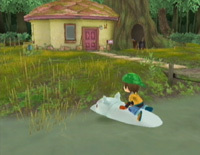 Theodore mentions that Humphrey likes swamps, so the area around Witch's house would be perfect for him. You have to use the whistle after you cross both of the foot bridges. 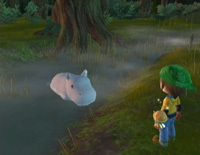 Humphrey will be in the swampy stream that is on the left-side of Witch's house. Pie Dough: You can make this by combining Wheat Flour and Butter in the Knife Set cooking utensil, or buy it from Oricana Inn for 990 G.
Cheese: You can use any cheese produced on your farm or you can buy some cheap Decent Cheese for 380 G at Horn Ranch. Vegetables: You will need 3 vegetables for this recipe; a Potato, Tomato, and Pepper. Potatoes grow in the Spring, Tomatoes in the Summer, and Peppers in the Fall. You can either grow these yourself from seed or buy them from Marimba Farm, depending on what level the store is. If you couldn't get a Potato during Spring, you can get a Perfect Potato from Yukimaro the Snowman during the Winter season. Once you have all 5 ingredients, use the Oven utensil to make the Vegetable Pizza for Humphrey. Bring it back to the Hippo and then go talk to Theodore. 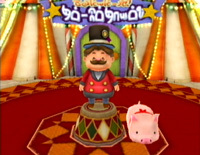 After you have found the 3 missing animals, Theodore can put on his super magnificant fantasy show! All of the animals put on their acts, and you can even get a picture of them once the show is over if you remember to bring your Camera. You have to watch the completed circus show to activate the taxi service. Your whistle will now have special powers (according to Theodore) and it turns all of the circus animals into a sort of "animal taxi" service around Castanet. You just have to blow your whiste and you can choose to travel to Flute Fields by elephant, to Harmonica Town via giraffe, to the Witch's swamp by riding Humphrey, and even Theodore's little pig will take you back to your own house in the Farmland district. 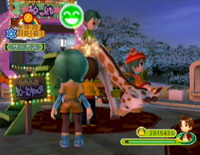 The circus animals are instant teleports, and are much faster than traveling by horse or by foot. There isn't a "warp" to the Garmon Mine district though, so you'll either have to go to Harmonia Town and take the mine cart short-cut, or go to your own farm by using the piggie and just walk up the mountain. If you want to take your family to the circus, you need to have them follow behind as you lead them there. Your kids can slide down the giraffe's neck and browse the other animals. A full circus show will be available when you have rescued Eunice, Trunks, and Humphrey. To start the circus show, talk to Theodore. The show that plays is the same every season.